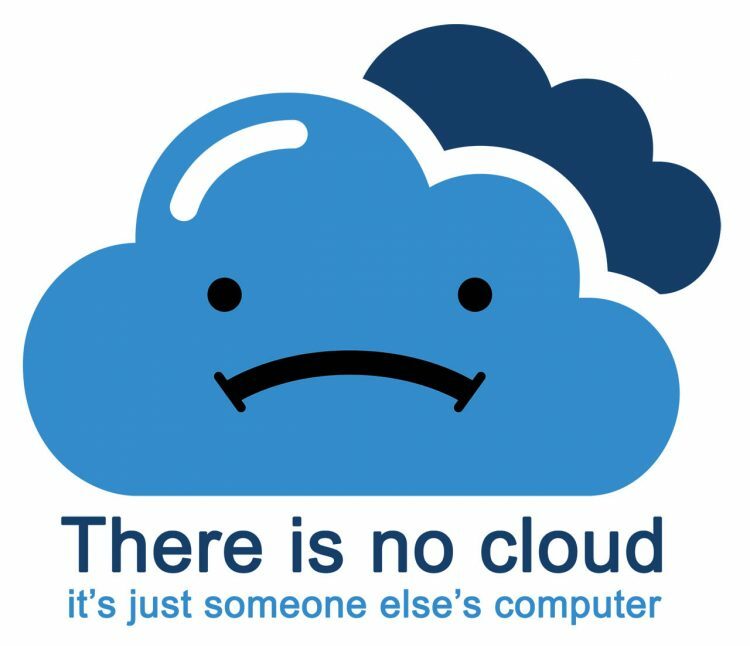 Full disclaimer: I say this as someone who does cloud hosting. I sell all of this. Cloud Services, virtual servers, everything in the Silver Spring Maryland Area for The NERDS Group. Despite the shrieking popularity and media coverage, The Cloud is a terrible choice for an overwhelming number of small and medium businesses. The Cloud often costs more over time, and brings a whole host of management problems that companies didn’t foresee. A business owner finds employees spending tons of time screwing around just to get some system to work. It’s just always been that way – Barbra set up a fileshare on her computer two years ago to get Greg a document he needed while email was down, and now that’s become the place everyone saves documents. Software has a tendency to crash, or be just plain old and unsupported. Everyone’s in agreement that something needs to be done about it, but the options are confusing and are accompanied by high levels of sticker shock. Enter: The Cloud. The promise of the cloud is framed to exploit that exact instinct – that this problem should be someone else’s, and we don’t have to think about it anymore. Need file storage? Upload everything to our servers, and we’ll handle that for you! Need accounting software? Boy, do we have you covered. Don’t have money to replace that server? Just click to create a new virtual machine! Gee willakers, that problem is gone. This also appeals to non-technical management who favor early adoption. A company who wants to appear cutting edge will spend an enormous amount of money on things they don’t need, because of an underlying conviction that whatever today’s fad is, is the one true way. Until next month, when there’s a different one true way. It’s oner and truer, you see. The common thread: These issues have nothing to do with core business. In an ideal world, you could just pay someone and the problem vanishes. There’s no strategic market advantage to solving any of them – it’s all in the same category of “I need to change the oil in my car or it won’t run.” If it was core business, they’d either have solved the issue or gone out business. A car dealership that can’t figure out how to buy cars from manufacturers is not long for the world. A car dealership who’s having trouble with their printers can work around that, at the cost of time. Yet, someone has to deal with and maintain the choice. This won’t go away by shoveling money to a company whose business model is providing a service with minimal support. They can’t – the margins are too small. Providers thrive on maximum automation and minimal staffing. I do to some extent, but I exist in a middle ground by design. It doesn’t matter if Dropbox can store your files. Someone still has to make the decision and then manage it in perpetuity. It takes time and experience to figure out alternatives and costs. Someone has to have a plan for when, not if, your cloud storage is unavailable. Or when that company decides to change the rates. Or when they decide to stop providing the service entirely. Stratus, cumulus, altocumulus – wait, wrong article. Backing up a bit. What is “The Cloud” that everyone and their grandmother is talking about? I split it into two categories – servers and services. I’m going to focus more on the negatives. There’s plenty of material about how Jesus and the next reincarnation of the Dali Lama live there, out there somewhere, ready to manage your email. Sorry Zoroastrians, you’re out of luck. Create Zoroahost, perhaps. The first cloud: Virtual servers. This is any server someone else provides. It can range from dedicated applications – most commonly, webservers like Squarespace – to a full server where you can run whatever you want on it. Names include Amazon AWS, Google Cloud, and Microsoft Azure. Rackspace, too. This type of The Cloud is the original gangster of what “The Cloud” used to mean. Back in the day, cloud computing started mostly an alternative to high performance supercomputers for doing large calculations. Things like weather modeling, nuclear blasts, and so on. You’d send a job out to a bunch of computers, some would run your calculation, and send you the result. Most small businesses don’t get involved in this. The why is straightforward – you need to have someone technical to get them to run. Thus, VM hosting is a trap for medium business and larger. The problem-slash-trap: One host, whose name begins with A, sells a small-ish (4 gb RAM, 1 CPU) Windows virtual machine for around $0.150 per hour. That works out to about $100 per month. Not bad. Until you extrapolate that number. The average replacement cycle is five years, and most businesses can stretch it further. You’re paying $6,000 in that interval, for a single virtual server. That’s about the number I spend on a pair of real, brick and mortar, physical servers that can run all the virtual servers a small business would ever need. As the business grows and requirements increase, the problem gets worse – economy of scale does not favor the VM provider. You still need someone to manage it and make sure it works. You won’t get backups, or any support. You need several virtual servers to provide a single service – virtual servers on the various cloud providers crash frequently. Security becomes paramount; if you can get to it, everyone else can too. Depending on what you want to do, getting to it in the first place can be a challenge if you’re maintaining security. To be fair, this is not a full-stop terrible idea for small businesses. It becomes terrible via marketing and impulse. I readily recommend using cloud services for some businesses. Others? No way in hell, get out of my office. Knowing which one is better comes down to understanding the business itself. How employees like to work, how large they’re likely to grow in the next five years, and similar business issues. For businesses with unreliable internet, external file sharing may be fantastic because they’re used to working around crappy internet connections. Other businesses have sensitive information, or need access to files even when the internet is down for two days. Two companies in the same market, providing the same damn thing can work completely differently in operations. The major disadvantages to cloud services: Low control, management issues, using too many cloud services overall. Since I get asked about it the most, I’ll use file storage as the example. On-site storage gives tremendous power over who can access what files and from where. You can audit it, be PCI compliant, have crazy levels of backup, make it available to remote users or offices, or anything else you can dream up. Cloud storage? Not so much. The management problem is more subtle. Most companies who decide to moving their storage have organizational issues on top of the easier question of where to store things. This is usually discovered after the data is moved out, and most of the operational issues still exist. The problem hasn’t gone away, it’s just in a new location with a fancy new interface. Nobody can find anything, and everyone’s still overwriting everyone else’s excel spreadsheets. Fantastic. The total cost of ownership can be lower here, no doubt. What I recommend for companies looking for cloud services is to figure out what the break even point is for their entire business as a unit – at what point is it cheaper to run *all* your services from your office? You need to have an IT budget that accounts for all the expenses at once. You should have a five or six year IT plan. Decide once, and make minor adjustments. In technology, there’s a pattern: Doing something once is expensive; doing something ten times is cheap. Continuing to pick on cloud storage, it will always come out ahead of self-hosting if you consider it in isolation. Only after you look at your entire business at once can you compare the cost of either option. There’s a large investment in time and equipment to set up services in house, but hosting two or three services share almost all the same hardware and management costs. All of a sudden, cloud services are much more expensive when considered in total. They each win individually, but lose as a group. Simpson’s paradox, in finance. My advice to small and medium businesses is this: Take control of the problem once instead of dodging it fifty times. Assign someone new job responsibilities, hire a contractor, hire a new employee. I guarantee these issues are going to be the first of many, and someone needs to take the time to make accurate projections. Struggling with IT issues means you’re growing, which is good. If you fumble this now, you’re going to pay someone like me a ton of money to fix problems that could have been prevented and planned around. Does our philosophy strike a chord? Like and follow our page for more. Or even better, click here and reach out to us directly.